University of Wisconsin-Stevens Point’s Leah Bell, West Bend, is the recipient of the 2018 Wisconsin Outdoor Communicators Association and Outdoor Heritage Education Center scholarship. She is an undergraduate student in Wildlife Ecology - Research and Management, with an environmental communications minor. When applying, Bell noted that the scholarship would open doors in her career field, writing: “A membership and connections to people in the WOCA would bring me closer to my dream career of writing for some type of wildlife magazine.” As a high school senior, Bell won second place in the Wisconsin Outdoor News newspaper writing contest. “First Hunt” is one of the two stories featured in the attachment to this newsletter. *Outdoor Heritage Education Center (OHEC) in Hazel Green, WI, connects youth and adults with our natural resources. Founded in 1998 by Mark LaBarbera, OHEC’s mission is to increase the public’s understanding, appreciation and sense of stewardship for natural resources and professional resource management, including outdoor activities like hunting and fishing. Visit http://www.outdoorheritageeducationcenter.com. 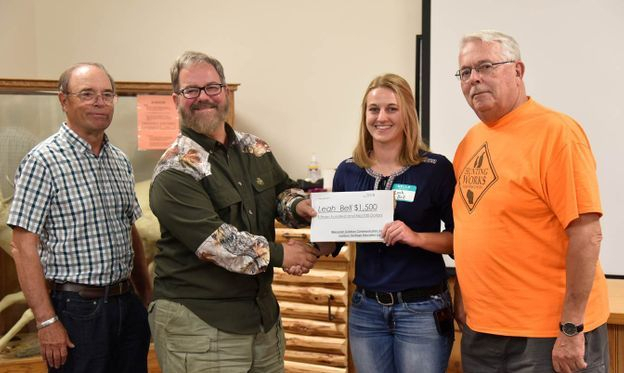 Left to right: Art Barlow (WOCA Scholarship Committee), Mark LaBarbera (Outdoor Heritage Education Center), Leah Bell (Scholarship Recipient), and Robert Wilberscheid (WOCA Scholarchip Committee. The WOCA 2019 Annual Meeting Information will be posted here as soon as it is available. The WOCA 2018 Annual Meeting will take place July 20-22 at Trees for Tomorrow in Eagle River. To download a PDF meeting registration form just click HERE. To download a PDF file of the meeting agenda click HERE. Members staying overnight at Trees for Tomorrow need to fill out a medical form for Trees for Tomorrow and attach it to the registration form. To download a copy of the form please check HERE. Make plans now to attend the 2018 WOCA Annual Meeting at Trees for Tomorrow in Eagle River. This is always a fun event and if you haven't attended one lately mark you calendar and download the registration form (above) to attend. Lodging is available at Trees for Tomorrow. You won't want to miss the Friday night cookout! If you know someone that is not a member but is an outdoor communicator, bring them along to enjoy the fun and maybe consider joining this great group of outdoor communicators.